Everyone has a family. And every family has a story. "This Is Us" chronicles the Pearson family across the decades: from Jack (Milo Ventimiglia) and Rebecca (Mandy Moore) as young parents in the 1980s to their 37-year-old kids Kevin (Justin Hartley), Kate (Chrissy Metz) and Randall (Sterling K. Brown) searching for love and fulfillment in the present day. This grounded, life-affirming dramedy reveals how the tiniest events in our lives impact who we become, and how the connections we share with each other can transcend time, distance and even death. From the writer and directors of "Crazy, Stupid, Love" comes a smart, modern show that will welcome you into a family you feel you've known for years. Download This is Us in Digital HD from the iTunes store. This is Us images are © 20th Century Fox. All Rights Reserved. 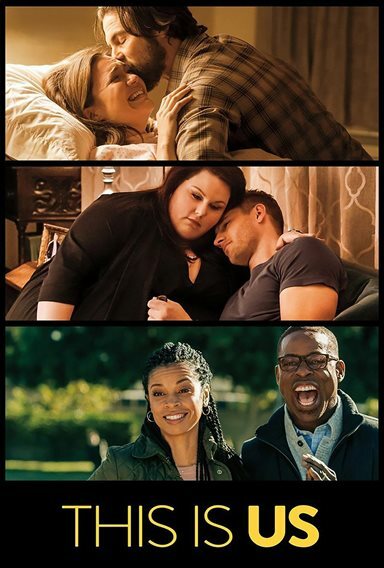 On September 20th, 2016, NBC aired the first episode of a new series called "This Is Us" and almost a year to the day, "This Is Us" is nominated for 10 Emmy awards and is the ONLY broadcast network show in the category for Outstanding Drama Series! If you really think about that seriously, one has to admit that NBC, ABC & CBS has to deal with restraints that cable (AMC, HBO) and streaming networks (Netflix & Hulu) don't. Broadcast networks deal with censors, commercial sponsors and rarely have the budgets of their Netflix & HBO counterparts! How did they do on Emmy night? "This Is Us" took home 2 Emmys, one for Outstanding Guest Actor in a Drama Series, which went to Gerald McRaney (best known for his work on "Simon & Simon", "Major Dad" and most recently on "This is Us" competition "House of Cards"). The second for Outstanding Lead Actor in a Drama Series, going to Sterling K. Brown (who won the Emmy previously for his work on "American Crime Story: The People VS OJ Simpson") for his role in the series. If you haven't heard of "This Is Us" you're missing out on one of the best drama series on network television! "This Is Us" is basically the story of a young couple Jack Pearson (Milo Ventimiglia of "Heroes") and his wife Rebecca (Mandy Moore "Princess Diaries" & "Tangled") who get pregnant with triplets. On the day they are born, Rebecca gives birth to a daughter and two sons, but one is stillborn. Their doctor who delivered the triplets (Gerald McRaney) tries to comfort Jack who is devastated and tells him about a black child who was born on the same day and was abandoned at a local fire station. Jack and Rebecca decide to adopt the boy as their own and just as they expected, leave the hospital with 3 children. Now "This Is Us" is told in different timelines, the past where you get to see Jack and Rebecca raising their 3 children and going through all the hardships that families have, and the current timeline where you get to see the 3 children in their late 30s with their own problems. Kate Pearson (played by Chrissy Metz from "AHS") who is dealing with issues from being overweight, insecurity, along with some secrets from her childhood that haven't all been brought to the light. Kevin Pearson (Justin Hartley from "Smallville") is having a midlife crisis of his own. Kevin, the star of a hit comedy series "The Manny", is tired of being treated as a hunk of meat and not taken seriously in his craft. Kevin tends to need everyone to be there for him and yet not be there for others, including his siblings. It's all about Kevin…at least to Kevin. And then there's Randall (Sterling K. Brown), the adopted son who has always been confronted with issues of his race growing up with a white family in a white neighborhood, and presently dealing with insomnia, compulsion to be perfect and is married with 2 daughters of his own. But Randall, never being able to let go of what happened with his parents, tracks down his biological dad, William A.K.A. Shakespeare (Ron Cephas Jones "Mr. Robot" & "Luke Cage"), who just after meeting his dad for the first time learns he has cancer. Did I happen to mention this was a drama? The thing that makes "This Is Us" so special, is almost everyone can relate to one of the characters and the problems they are going through. There's so many levels of emotional issues, love, death, stress, work, family…. (basically, you name it and it's on this show) and it's dealt with at different ages throughout a lifespan. Even I will admit that once you start watching it, you will be guaranteed to, at least once…if not more, choke up a little and find yourself grabbing for some tissues. The crazy thing is, you don't feel bad about doing so and the emotional rollercoaster will make you feel more intense than most shows you find yourself wasting time watching. So, my question to you is, have you seen "This Is Us"? Because if you haven't, you are missing out and need to get caught up on the guilty pleasure of the 2016/17 television season. Warning: Please note…. once start you may find yourself binging the entire season without leaving the sofa, pints of ice cream & other comfort foods are needed and you may want to get a new box of Kleenex just in case. 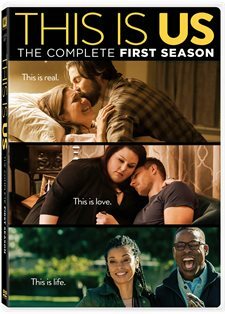 Now, on the other hand, if you have seen it…you're already a fan and need to have this set for your collection so you can watch and re-watch and keep it fresh in your mind for when season two of "This Is Us" kicks off season 2 on September 26th…9pm on NBC! Another plus is the extra "After Show" that accompanies each episode and includes interviews with cast and crew. These are a nice bonus as they give some additional insight into the characters and the episodes. I give "This Is Us" 5 out of 5 Kleenex! It's truly the best broadcast television has to offer! If you like dramas…. this is a must see!